Solution: In 1986, Larson installed an integrated, solid liquid mixing system to wet out the PVP iodine powder before it enters the mixing tank. The system carries out three major functions: 1. Dry material delivery 2. Fluid distribution, and 3. Low shear dispersion. 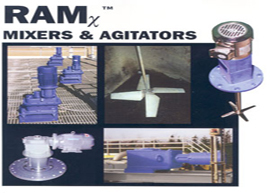 The machine has the capacity to automatically and continuously mix 6-75 gpm of any pumpable liquid with up to 350 lb/min (depending on the bulk density) of powdered solids. 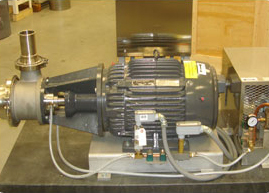 The diperser is powered by a 5 HP, 1800 RPM, TEFC motor. Dry powder to be fed to the system is held in a portable solids bin and conveyed by a ribbon into the processor's 6 cubic foot hopper/feeder. 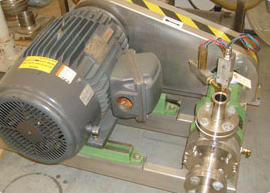 A variable-speed, open flight screw auger delivers a measured amount of PVP Iodine into the liquid distributor area of the machine. Water is metered at a flow rate controlled to combine with the powder in the desired proportion. The design of the processor provides for the water to flow down the walls of the liquid distributor while the powder falls in parallel to the liquid flow. 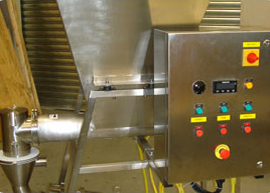 Liquid flow along the walls prevents buildup of any dry or sticky powder agglomerates. 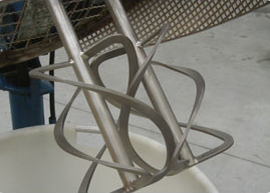 The combined solid and liquid flows enter a dispersion chamber where a four-part, retreat sweep dispersing blade completely disperses all of the powder evenly into the liquid. The dispersing blade also provides the negative pressure differential required to draw the materials into the throat of the chamber. 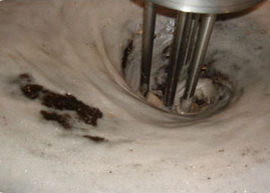 The mixing system has been installed in a continuous flow scheme where water is mixed with the PVP iodine on a once-through basis and discharged into the mixing tank. The key operating feature is the ability of the system to wet our the PCP iodine completely and not allow any lumps or agglomerations to form. When quickly wetted out at the 1% concentration, the viscosity of the resultant slurry does not go above 550 centistokes. Dissolution of the PVP iodine continues in the mixing tank. Results: Use of the integrated, solid-liquid mixing time necessary to wet pit the PVP iodine powder has reduced the mixing time necessary to produce a uniform 1% solution to about one third of what it was using the mixing tank alone. Because the powders are contained within the mixing system and no longer form lumps, the exact percentage concentration can be more closely determined than when significant amounts of powders were lost as agglomerations or as dry powder. Complete and consistent wetting out pre-weighed amounts of powder has minimized the time it takes to adjust the solution concentration to the exact amount. 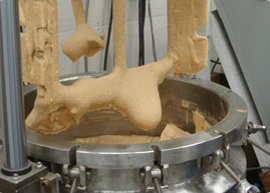 Confining the powder has made the overall condition of the mixing area substantially cleaner. Less time has been required for cleanup. There are none of the sticky which used to require hand attention by the cleanup crew. Larson now plans to modify the flow scheme so that the slurry in the mixing tank can be circulated through the integrated, solid-liquid mixing system to accelerate dissolution of the PVP iodine.